International Exhibition of Modern Art [The Armory Show], Association of American Painters and Sculptors, Armory of the Sixty-Ninth Infantry, New York, 1913, no. 139 (not shown in Chicago or Boston). Modern Art and America: Alfred Stieglitz and His New York Galleries, National Gallery of Art, Washington, 2001, no. 28. The Armory Show at 100: Modernism and Revolution, The New-York Historical Society, New York, 2013-2014, unnumbered catalogue. Brown, Milton Wolf. The Story of the Armory Show. New York, 1963: 265, 139. Reich, Sheldon. John Marin: A Stylistic Analysis and Catalogue Raisonné. Tucson: University of Arizona Press, 1970, no. 12.66. Fine, Ruth E. John Marin. Washington, DC: National Gallery of Art, 1990, p. 124, pl. 112. Block Points: The Annual Journal and Report of the Mary and Leigh Block Gallery, Northwestern University I (1993): fig. 6. Modern Art and America: Alfred Stieglitz and His New York Galleries. Exh. cat. National Gallery of Art, Washington, 2001: no. 28. Kushner, Maryilyn Satin. "The Armory Show at 100." American Art Review 25, no. 6 (November-December 2013): 72, color fig. Wagner, Ann Prentice and Josephine White Rodgers. 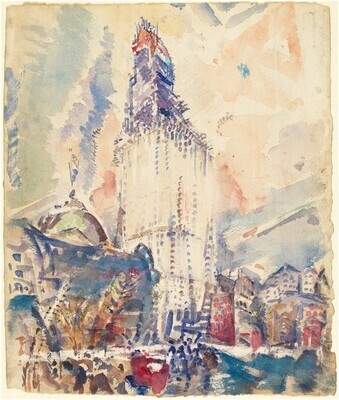 Becoming John Marin: Modernist at Work, Exh. cat. Arkansas Art Center, Little Rock, 2018: 19, fig. 2.9.